What happens when I derail? Beeminder will send you an email called the "legitimacy check" that lets you know you've derailed, how much we're charging you, and what your post-derailment pledge level is. If the derailment was an accident, reply to that email to let us know, and we'll get it fixed up! After 24 hours, the derailment charge is processed. We reset the graph, restarting the road at your current data value and heading toward the same goal as before. Unless you've turned on the no-mercy recommit setting, we'll also put in a 7-day break period on the goal. If you feel that the goal was a little too ambitious, or maybe the goal isn't something you want to pursue anymore, you can make it easier or quit it! If you do it shortly after you derail, the changes will take effect before you'll need to start working on the goal again. 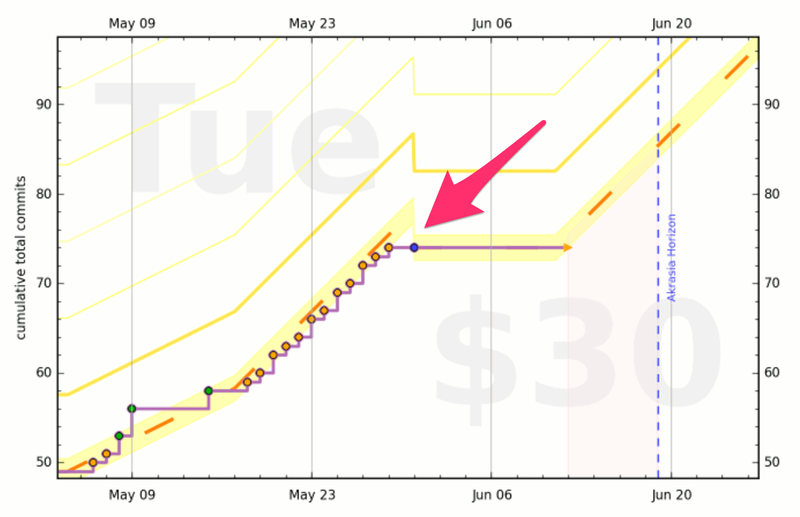 In the goal below, for example, I extended the break after derailing a few more days.